We need to expand and clarify our PREVIOUS POST about the proposed ACHD vehicle fee hike which gives a free ride to anything over 8,000 lbs. Some commishes complained that we focused blame on them while they were “merely following the state code.” They are correct with regard to being bound by the state code, but the fact remains they plan to pass a resolution July 11 which will unfairly tax ALL passenger cars while exempting most commercial and heavier trucks from paying ANY fees to ACHD. The current law is unfair and unequal regardless of who got it passed. The fee hike proposal is akin to taxing residential property, but exempting commercial property in excess of 8,000 square feet. It is simply wrong–without attributing “blame” to any particular political body. The immediate fix would be a two year limit on the unfair tax with the idea of seeking equality from the 2019 legislature. There is apparently a provision which allows the fee hike only in even numbered years, hence our suggestion of a two year grace period. We talked with one legislator who thought it possible to get a commitment from legislative leaders to allow ACHD to levy fees against those big trucks once the law is fixed. He has more faith in his colleagues than does the GUARDIAN! If ACHD commishes stick with their planned ballot language for the fee hike, citizen motorists risk having the unfair tax forever since it can only be repealed by the voters and repeal would be an onerous task. We understand that ACHD is victim of the unbridled growth and is forced to react to the demands caused by the city, county, and state politicos who do everything they can to encourage growth which simply does not pay for itself. We object to financing their work load on the backs of only a select portion of the motoring public. As farm land has diminished due to over-development, the number of farm implements has greatly decreased. It is not an inconvenience to tax a business like Idaho Power or anyone really for use of the roads. An already taxed and strained infrastructure is causing a now $165mm construction cost at the Nampa waste water plant. Eventually the same will be for the roads in the county. Bigger, Heavier, trucks without an increase is akin to getting away with murder. Idaho is the talk of the truck industry with fines for overweight so low the trucker is stealing and causing issues and getting away with it with ease because of the current political climate here. Truckers brag about our low rates and the damage they can due. Spend time in a truck stop or be a part owner in a trucking company like I am and you’ll hear it. EDITOR NOTE–To be clear, Ada County is the ONLY countywide highway district and the only county to have a surcharge for passenger vehicles. Overweight and other trucking issues are strictly a state of Idaho issue. I would consider voting for it on a 2-year basis if: 1. I see a specific list of projects/activities that won’t get done without the fee increase. 2. A written commitment from ACHD that they will lobby for the change in law, including a list of activities that they have taken and will take in the future to that end. 3. Neutral ballot language. However, after reading Sara Baker’s proud statement that “We must follow the law and we do follow the law” and then reading that ACHD lobbied on behalf of that law, the preferred option at this point is to just say NO to any additional taxes/fees until they get the law changed. And maybe not then. EDITOR NOTE–ACHD certainly lobbied for the local fdee surcharge on vehicles. The legislature didn’t just come up with that one on their own. However, after nearly 30 years it is unclear exactly WHO proposed the exemption for the vehicles over 8,000 lbs. It is perfectly clear that no one has ever exposed the inequity or made any attempt to apply the fee to those who do the most damage and profit from using our streets. Taxes will pass through. Equipment safety and weights are the problem. Fees on trucks will simply pass through to consumer. If change to be made, 8000 is too light and should be increased to 11000 so as to include all the f-2500/3500 personal vehicles. Local short haul trucks seem to be in poor condition and overweight at times. Nothing being done about it? Does Ada or Boise employ anyone who can enforce weight and truck safety regs? No. 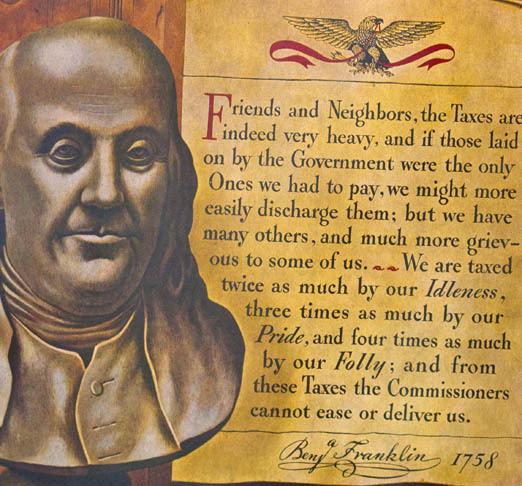 God Bless America… and Benjamin Franklin. What an amazing human being. Or just make Three Cities River Crossing a toll road!!!!!! I guess I’m not fully understanding the issue in relation to Idaho Code 49-402. Does that section apply only to local governments levying such a fee? Commercial categories for over 8,000 are similar. EDITOR NOTE–The ACHD fee is an EXTRA FEE (surcharge) over and above the state fee schedule. Ada vehicle owners currently pay more than the state fee and ACHD plans to increase that fee. The state law “enables” them to charge up to two and a half times more than the state fee. The law applies ONLY to county-wide highway districts and ACHD is the only one in the state. The state law as written applies only to vehicles under 8,000 lbs. The GUARDIAN wants it to apply to all vehicles using our roads.